The last, and only time I have ever been to Mexico was in 2004 when I spent spring break with a few friends in Puerta Vallerta. It was a booze-filled, raucous good time filled with yard long drinks and quarter-yard length skirts. Why then, did I not visit Mexico again until September 2017 ? To be honest, it was fear and that old, unwanted friend called anxiety. Fear about not speaking the language, about crowds and about violence in the region. Anxiety about if I would have enough clean water to drink and what produce I would need to avoid. Luckily for me, my fears were tranquilized by the serenity of the city of Puerto Peñasco in the state of Sonora, Mexico. You see, there are no flights to Puerto Penasco so it is serene as can be. And, Puerto Peñasco is a safe beach resort in Mexico. One of a number of signs welcoming you to the city of Puerto Peñasco, Mexico. Right off the Puerto Penasco Beach. Sweet abuelitas taking a break from the heat on the malécon of town. This area is a generally safe beach resort in Mexico known as Puerto Peñasco. There are none! There are no commercial airports in Puerto Penasco and thus, no flights to Puerto Penasco. You will have to fly into Phoenix or Tucson to get here. Or, if you have a private plane, you can fly into the Sea of Cortez International Airport. And if you do, I wonder if I could join you for one of your flights to Puerto Penasco. Ha! Puerto Peñasco is a desert on the sea. For miles and miles in any direction, all you see is sun-bleached, dried-out earth. You may see the ocean, but it depends where you are looking. I had never been to such a vast desert before, so to me, it felt like I was in my own version of Mad Max: Fury Road. 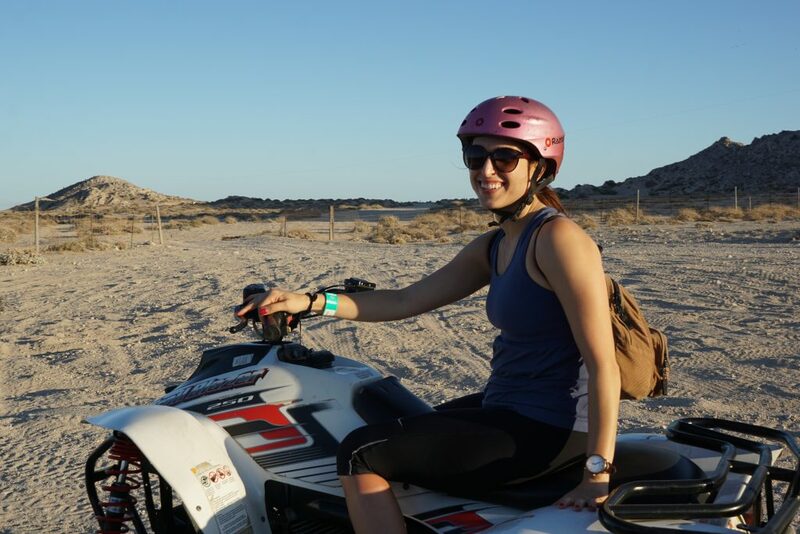 This feeling was exacerbated when we spent 90 minutes cruising through sand dunes on ATVs. Here I am on an ATV. This was my first time riding an ATV and truthfully, it is not my cup of tea. It was a little loud and hot and I didn’t feel secure wearing a bicycle helmet on a motorized vehicle. No one else was worried about these things, but such is the life of the anxious traveler. 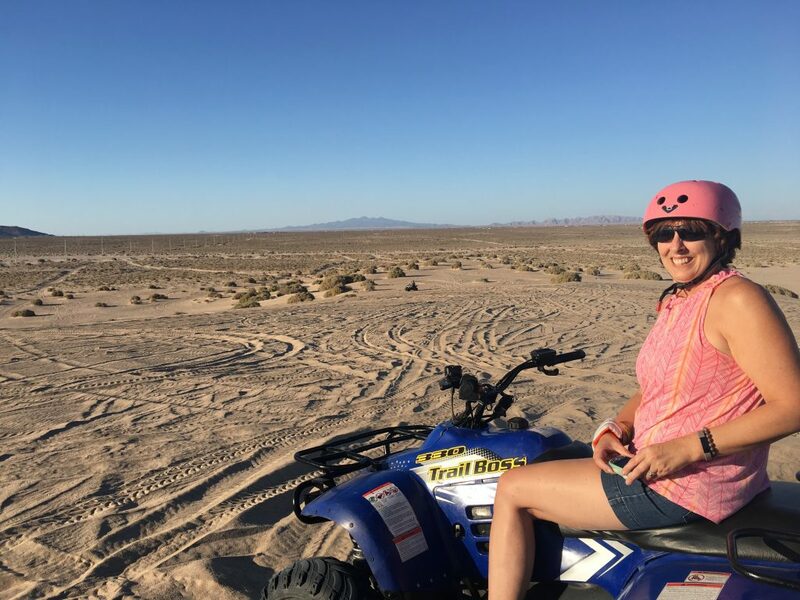 Susan, the Gen-X Traveler, did not worry about being in the desert on an ATV. She enjoyed herself so much that her vehicle overheated and she needed to give it a break before she could continue. Luckily for my group, no one was acting like much of a daredevil. Others weren’t so lucky. Some of the group went out in “quad” vehicles. Here, Romeo and Katherine Belarmino strike a pose. 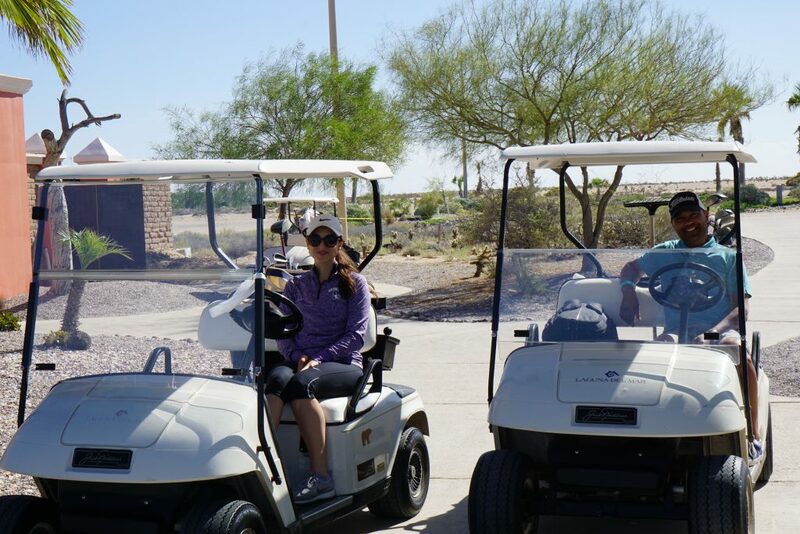 We also had the opportunity to golf on our visit. Full disclosure: my fiancé tells me I am a terrific golfer. That’s why I’m marrying him. (Just kidding.) My final scores are never great and my putting is in a constant state of “needs improvement,” but I am generally confident about my game. Correction: I was confident until I was bested by the Jack Nicklaus Signature Golf Course known as Laguna Del Mar. The first nine holes were under construction so we played the back nine. This activity was an alternate plan because it was so windy that our water based activities were cancelled. While we were supposed to snorkel, conditions were too windy for us to be on the water, so clearly it was a great day for golf! Romeo of Golf the World as well as a representative of Puerto Peñasco tourism played with me. Rome finished with par and I elected to not finish the last three holes. It turns out that this course, while beautiful, was best suited for a more skilled player. I really enjoyed the landscape and the view of the little town on Cholla Bay. Unfortunately, the selection of rental clubs was not very plentiful but I anticipate as the course finishes construction, that will be remedied. 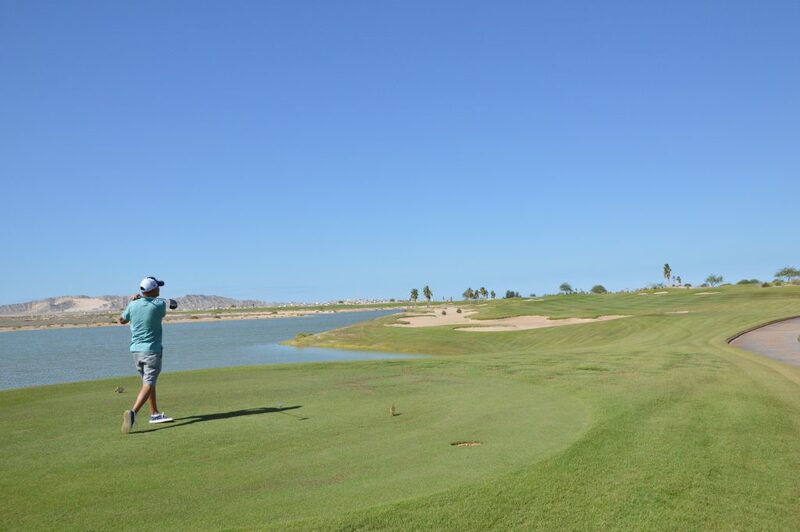 There are two other golf courses in Puerto Peñasco. One is Las Palomas, part of the property where I stayed, and the other is at The Grand Mayan, a Vidanta luxury resort about 45 minutes from the city center. 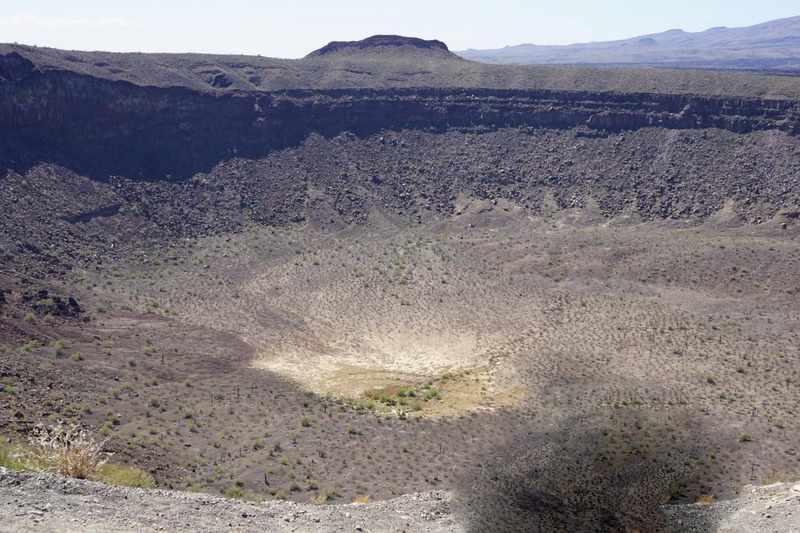 The UNESCO El Pinacate y Gran Desierto de Altar Biosphere Reserve consists of three volcanos and takes about two hours to cover the grounds. Photo c/o Alexa Meisler. 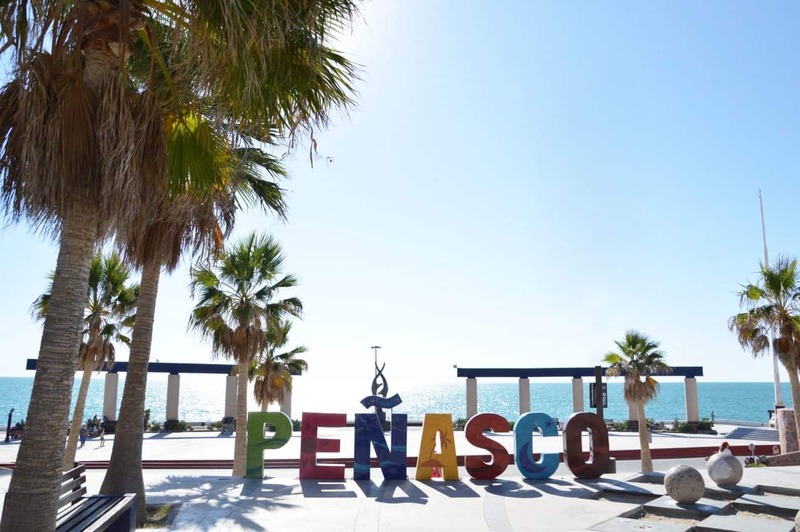 The jewel of Puerto Peñasco is perhaps the UNESCO World Heritage site of the Biosphere. Located about one hour from resort row, it is worth the drive. The biosphere is a collection of calderas from collapsed volcanoes that were active thousands of years ago. With a fifty-peso entry fee, this site is a “can’t miss.” Be forewarned, however: there are no bathrooms on the property other than at the entrance. With a circumference of about 75 kilometers, a day at the biosphere is a time commitment. To be appropriately prepared, bring plenty of water, a hat, sun protection, and sneakers. Looking straight into one of the caldeiras. Photo c/o Alexa Meisler. 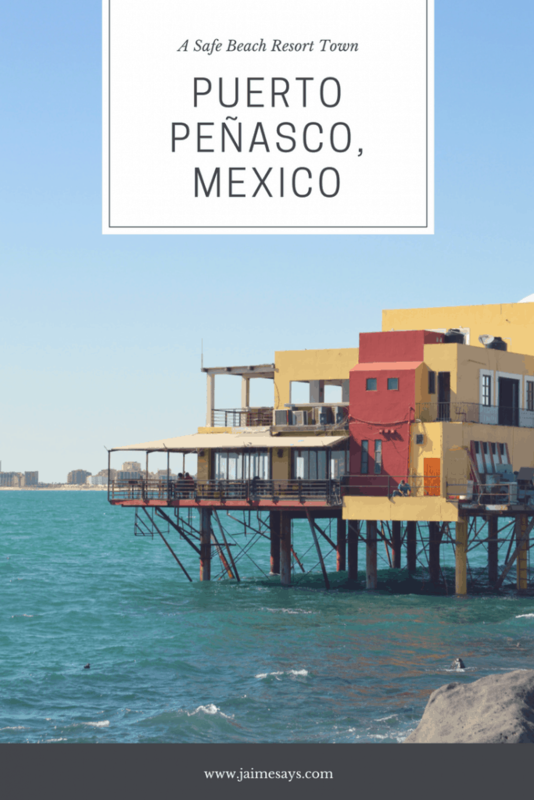 Puerto Peñasco is on the Gulf of California. To be more specific, it sits on the northeastern curve of the Sea of Cortez. It is a relatively safe beach resort in Mexico, and a fisherman town with many aquatic activities. First off, there are a bunch of Puerto Penasco beach areas to visit. From there, you can participate in any water activities! Jacques Cousteau once called the Sea of Cortez “the aquarium of the world,” because of its abundance of sea creatures and picturesque beauty. Scuba divers and snorkelers will delight in the biodiversity of the water. Visitors can arrange excursions with tour operators through their hotels or on the malécon. Sunset Cruise Operator Senorita Rita not only has restrooms, food, and drinks onboard, they also have disco lights and a speaker system for dance parties. Sunset cruises, whale, and dolphin watching excursions are also popular in the area. 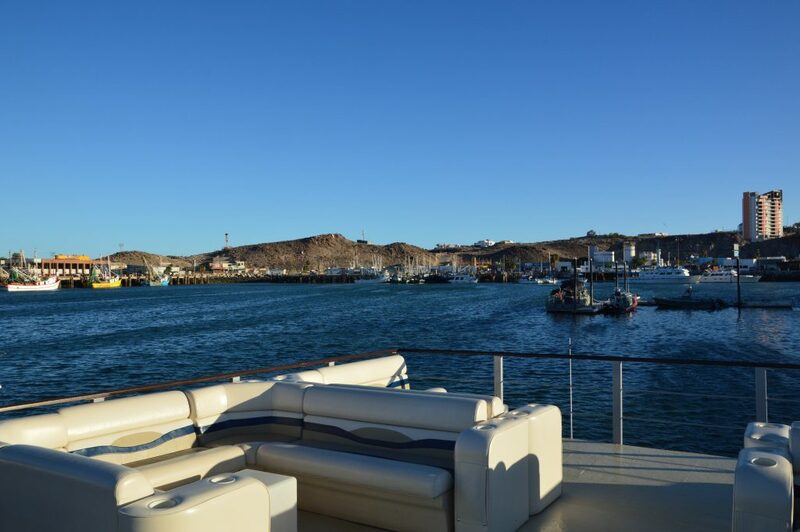 In fact, The Sea of Cortez is so diverse that we saw dolphins in the water without even leaving the dock! 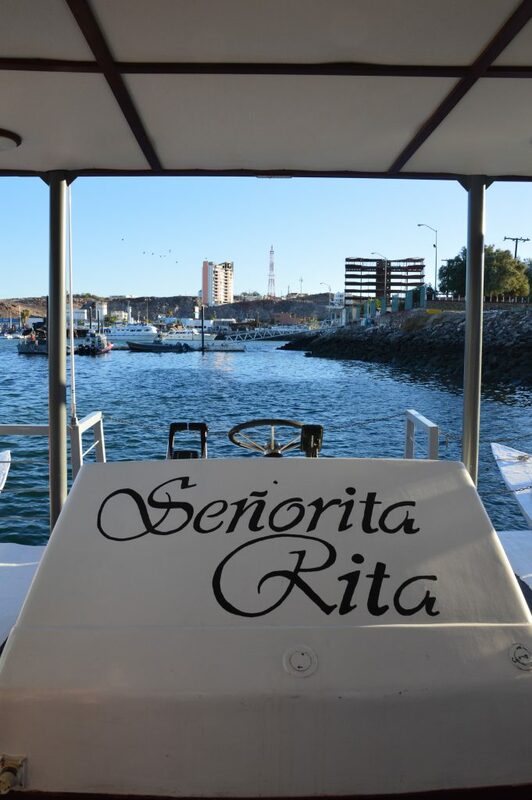 Aboard the Senorita Rita, we enjoyed comfortable accommodations. There were men’s and women’s bathrooms, a fully stocked bar, and sandwiches. Lots of seating space on the double decker boat of the Senorita Rita. The most surprising aspect of visiting this relatively safe beach resort in Mexico was how accommodating the restaurants were. The food in Puerto Peñasco was on another level. I anticipated that I would have to adjust my eating habits and be diligent about the items I avoided. I planned to avoid produce, iced drinks, and tap water. Lot of chips and salsa, enchiladas, and bottled water would be my go to. Boy, was I wrong. The ice at every restaurant was made using filtered water, the restaurants had filters, and the resort operated on filtered water. While I was still diligent about only drinking bottled water, the other 12 individuals on my trip drank iced drinks and tap water with impunity. Guess what? None of them got sick! How great is that!? 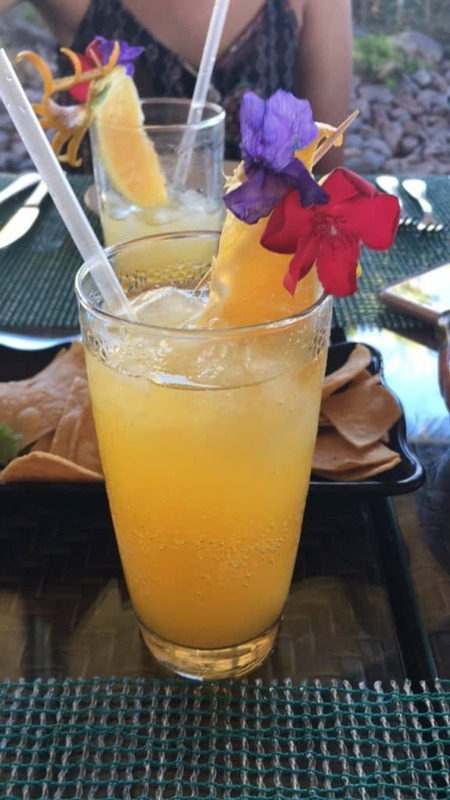 A delicious and well presented passionfruit lemonade from the Otomulata restaurant at the Mayan Palace. Holy Guacamole; the quality and diversity of restaurants in Puerto Peñasco was enough to wow this Chicagoan. No matter where we went, be it a resort property or a stand-alone restaurant in town, the food impressed! I traveled to Mexico and I dare say that I ate only a few dishes that I associate as Mexican. The most memorable restaurant we visited was called La Casa de Capitain. 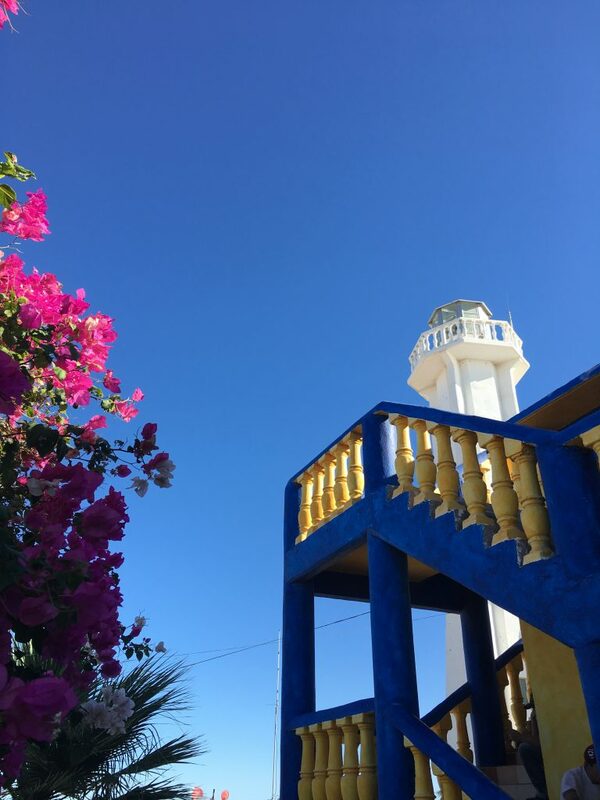 Located high above the Sea of Cortez, this brightly colored restaurant had the most beautiful lookout point of any place we visited. With these views, it’d be hard not to at least stop in at this restaurant. It also had the best, okay, only, guacamole and chips that I had on the entire trip. When paired with the amazing octopus ceviche on this sample platter, this place hit the spot. My favorite restaurant that we visited was called El Tapeo. 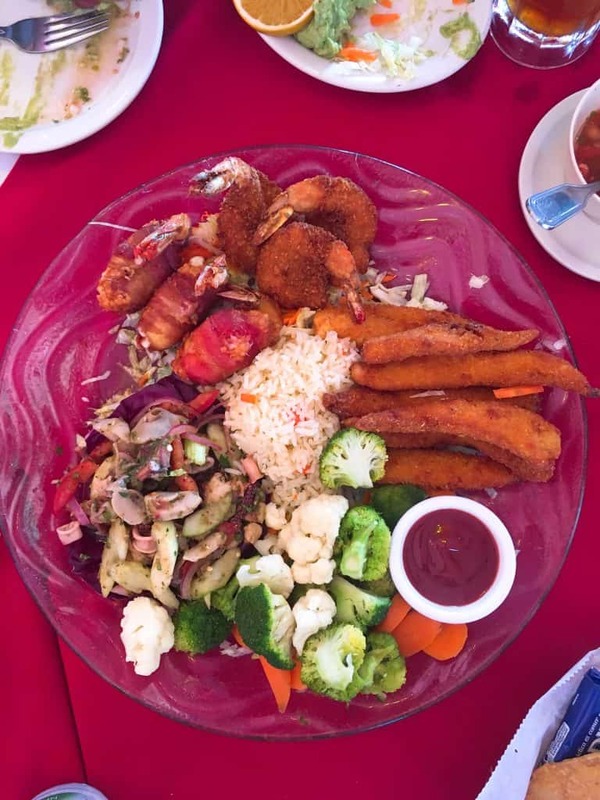 Located on the grounds of the Best Western in Puerto Peñasco, a safe resort town in Mexico, this restaurant had the most gourmet food and most fun atmosphere of any we visited. In the interest of full disclosure, most of the other restaurants we visited served steak as main dishes, a food that I don’t eat. I currently don’t have food allergies, but there is something about both tequila and steak that does not sit well with me. El Tapeo is billed as a wine bar, and as such, they have an extensive list of mostly Mexican wines. 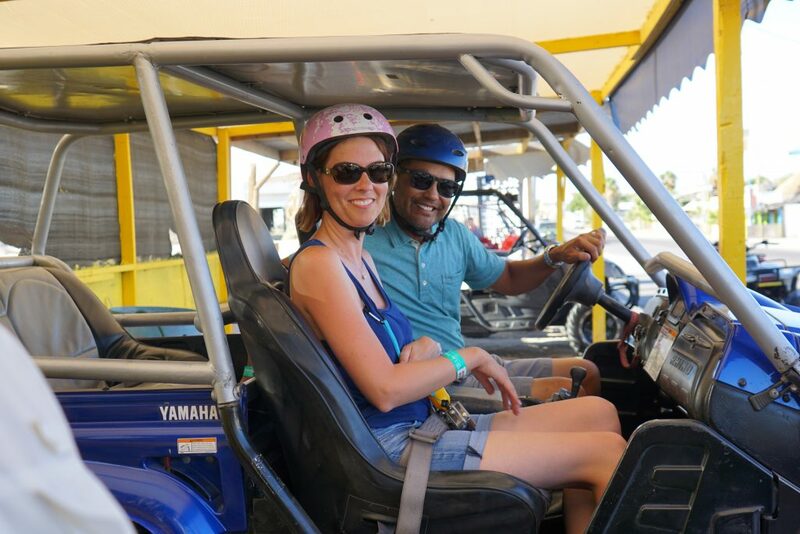 I know next to nothing about wineries in the Baja region, but luckily for our group, sommelier in training and wine blogger Erika Beach was with us. Now she is a woman who knows a thing or two about wine, especially wine from this region. She selected a fabulous bottle of wine from the menu that paired excellently with the charcuterie board and paella courses. 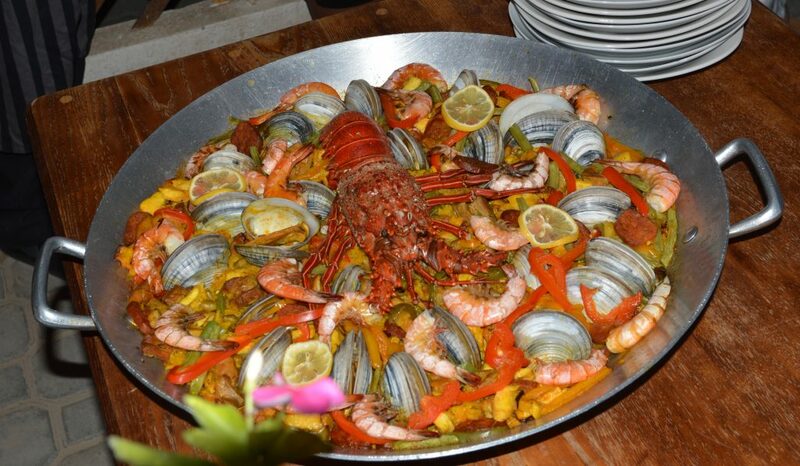 Check out this paella! Clams, lobster, shrimp, sausage… it was incredible. I’m still thinking about this dish. 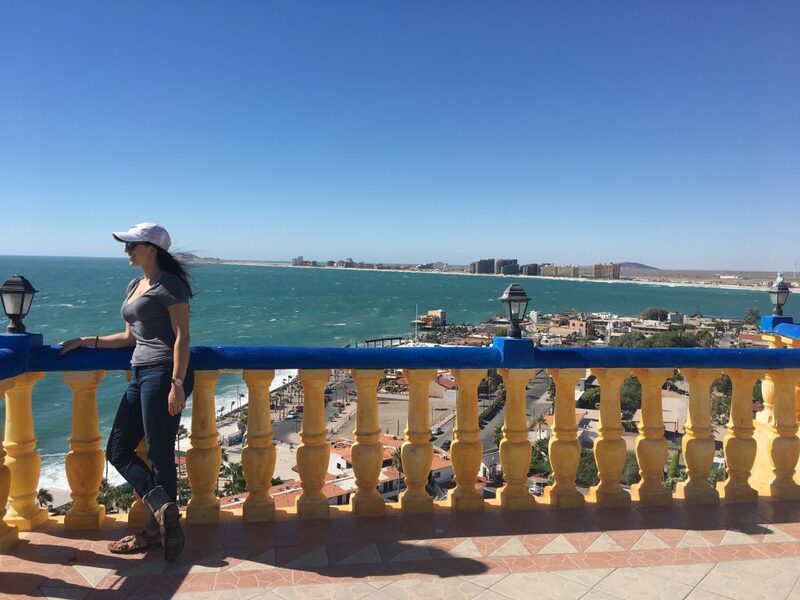 My trip to Puerto Peñasco opened my eyes to an enjoyable vacation in Mexico as an adult. With calmer pools and properties than the more well known Mexican resort towns, it’s a quaint fisherman village with many of the amenities I’d expect in America. 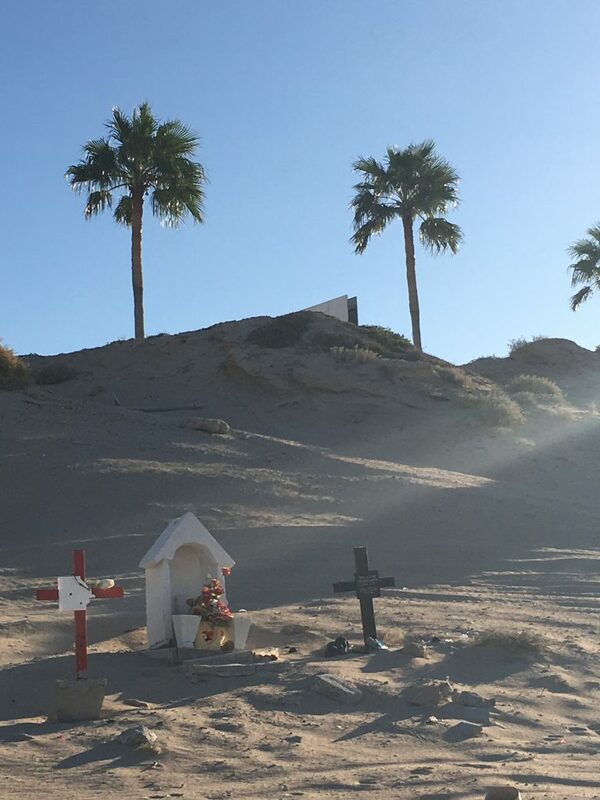 Finally, Puerto Peñasco is a safe beach resort in Mexico is because of the lengths that Las Palomas goes to in order to ensure guests security and enjoyment. Many thanks to Rocky Point/Puerto Peñasco Tourism Board for hosting my stay. While I was not financially responsible for the details of my stay, all opinions are my own. Loved it Jaime!!! Great read! We love it there also…so much we bought a place in the Sonoran Sky! It’s an amazing property with an amazing staff. Try it next time. Also, FISH restaurant is our favorite. That’s so cool! It’s such a hidden gem. Where is FISH located? Of the Malecon where you went to the restaurant El Capitian. There is also an amazing restaurant there called Pane Vino! Both amazing and a great view. One more relatively safe comment and we all were gonna chide you. It’s safe and low key. I go there every chance I get. The biosphere is amazing! Easy and beautiful 4 hour drive from Phoenix/Tucson. Affordable weekend getaway. Cruise ships are coming soon! I was raised in Rockford, IL, so I know what a long cold winter is, as well. First time to Puerto Penasco, aka Rocky Point from Arzona and California visitors, drove all the way from Rockford to Mexico 23 years ago. Living in Arizone 22 years has made the drive down to 3 hours insread of days. We travel there by car at least twice a year and have never had any issues arise. Actually, we are gearing up to retire there next year! The Sea of Cortez is bluer than anything in California, in my humble opinion. Do not miss out on this stunning, safe and wonderful gem. The locals welcome you with open arms, as do all the Expats. Even Al Capone hid here, back in the day. It is a cheaper place than some of the other popular beaches in Mexico. Road trip from Rockford! Wow, that’s dedication! I agree, it’s a fabulous town! I’m always so happy to hear about how safe and fun Mexico can be. 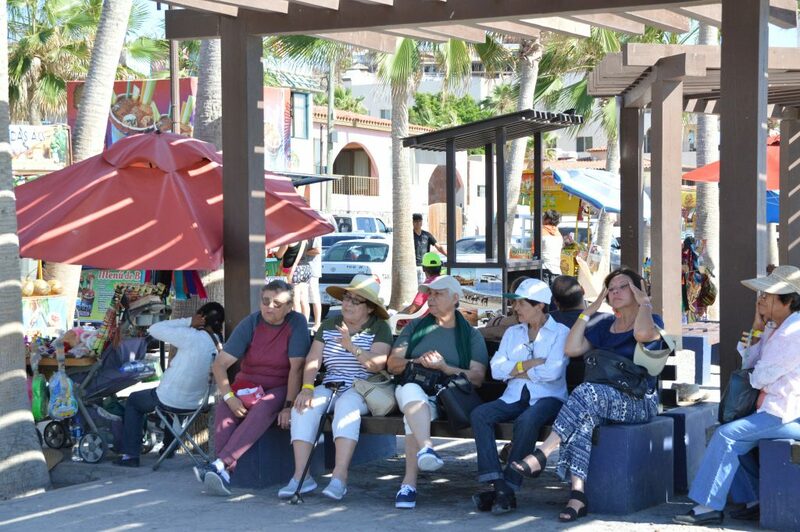 I loved visiting Puerto Penasco and look forward to returning one day with more friends. I’ve been to Puerto Penasco several times, but on a completely different trip. A favourite band of mine (Roger Clyne and the Peacemakers) does a huge music festival down there once a year (used to be twice) called Circus Mexicus. It’s great fun, but I never seem to find the time to do anything else besides concert-related stuff and drinking. 😉 One day I’ll have to go back and actually see the place. That’s neat! What time of year does the concert usually happen? It’s in June! Usually the second weekend. Oh, how I love the vibrant colors of the architecture of Mexico and that seafood! YUM! I have never heard of this area, so thank you for sharing a new part of Mexico with us! OMG I’m so glad you went!!! It looks like such a fun destination. I think messed up last time I tried to leave a comment here. For now let me remind you that according to the Unabridged Romeo’s New International Dictionary, The Definition of a good golfer is a person who enjoys the game whilst simultaneously enriching the experience for other playing partners. So you are excellent! You are being kind! Eddie tells me it’s all about the pace of play, so I make sure to keep that going! I love how in depth you went with the tips, how to get there, that tap water is drinkable, etc. I’ve never heard of Puerto Penasco before but now I’m curious to see it for myself. Thanks for the kind words, Annemarie!